Like too many tragedies, this story begins with love. A man loved a woman. The woman he loved stopped loving him back. And the woman had to die. 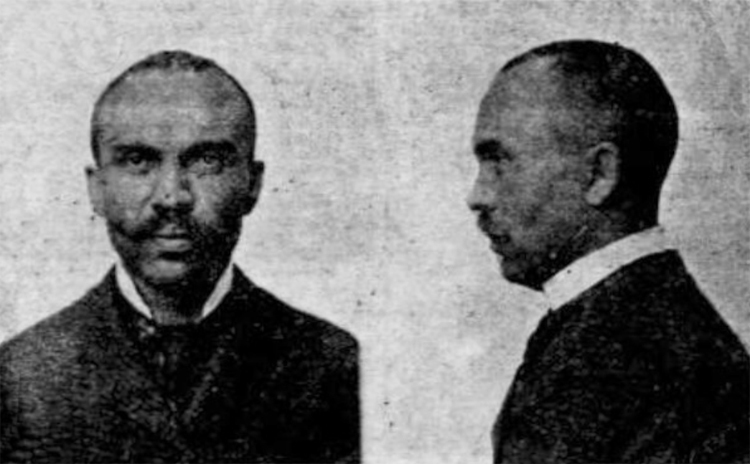 According to Henderson, they met in Chicago in 1901. “It was a case of love at first sight,” he later testified, and “both of us were overcome by our passion” which “led to an immoral life.” Soon, Ida became pregnant, and Henderson sought to save her “from disgrace” by marrying her. She refused because, as it turned out, she was already married to someone else—her second husband, Dan McCormack. This small obstacle didn’t stop Henderson, however, and he said she agreed to take his name and live with him as his wife. Sadly, their baby died after only three weeks of life, and the shame of community scrutiny and possibly having their pretend marriage found out drove Henderson to Duluth in search of work and a fresh start. Henderson came north in the spring of 1902 at the encouragement of a friend named William Dawson, who worked at the Spalding Hotel. Henderson was in the Zenith City for nearly a month, writing Ida every day, when she wrote him that she “would not stay in Chicago another day and wanted to come to Duluth.” Henderson got an advance on his pay and sent for her. His friend Dawson gave up his rooms at 721½ West Superior Street to them for a place to set up house. Henderson later told the court, “From the moment she came it seemed that a dark cloud hovered over us.” Dawson appeared to show a great deal of interest in Ida, once asking her to dine with him, while Henderson waited on them in the dining room at the Spalding. When Henderson returned home that night, Ida was not waiting for him. When he finally went to look for her, he met her on the street. She claimed to have been visiting a female friend. Henderson thought this “peculiar.” Another time, he said he came home and heard noises inside as if somebody was getting dressed very quickly. Repeatedly, Dawson and McCormack denied that they were having an affair. According to witnesses, they quarreled often, and Henderson physically abused McCormack, once throwing her onto a bed and choking her. After this incident, she fled to Minneapolis in fear for her life. Some days later he ran into her on a Duluth street. She would not look at him or greet him. This infuriated him. When Henderson couldn’t discover where McCormack was staying, he went to the police, telling them he needed to find his wife. Denied help there, he hired a private detective. Eventually, he found that she had rented rooms at 119 West First Street. On June 21, McCormack went to the police, saying that Henderson was harassing her and threatening to kill her. Duluth police chief Chauncy Troyer advised her to swear out a warrant, but since it was late Saturday afternoon, she ought to wait until Monday. Within ninety minutes, Ida McCormack was dead. She showed Rivers a letter she was going to send to Dawson through a friend of his. At this, Henderson sprang from the closet, armed with a four-inch pocket knife, and snatched the letter. McCormack grabbed it back and threw it out the window, and tried to run away through a side door. Before she could open it, Henderson slashed at her with the knife. Screaming with fear and pain, McCormack fled through the occupied rooming house, with Henderson in close pursuit, stabbing her at every opportunity. Desperately pulling at locked doors in the hallway, she finally got into another woman’s flat, where the woman tried to close the door on Henderson. She failed, and the enraged murderer pushed into the room, flailing out at the other women inside, one with a babe in arms. To the witnesses’ horror, Henderson caught McCormack and slashed her throat from ear to ear. Blood spurting everywhere, she fell to the floor. Terrorized, Rivers jumped from a second story window onto a nearby shed and ran away down the alley. The next day, the Duluth News Tribune published the contents of two letters McCormack had written just before being killed—one of which was addressed to William Dawson, the other of which was found in the dead woman’s pocket. Darling—I must see you this evening. I did not know whether you would come tonight as things were so awful, but it is all right, my own; I love you best of all and things will all come out all right. You understand everything will be O.K. for us now, sweetheart, as ever the same. NO, Charles, you know I am nothing to you and never will be as long as I breathe the breath of life. You have made a fool of me and when I say a thing I mean it. No, no, I won’t accept any money of you. I am going to stay here too. I am tired of this business and you are going to leave me alone. Now I haven’t gone out with any one and I am free privilege to go where I please. I don’t belong to any one at all and yet I am a woman. I am tired of you dogging me around, so if you stay here make up your mind to it if you like, as my being as much now to you as I ever will be in this world, so please save trouble by leaving me alone.